Like the end of the 20th century, the beginning of the 21st century has been characterized by an ever-interdependent global economy. Perhaps no business has revealed the geopolitical implications of local politics as much as the oil industry. From central Asia to the Middle East to the United States, oil has become an overt -- or, often, implicit -- factor in local power struggles, international conflicts, and even presidential campaigns. 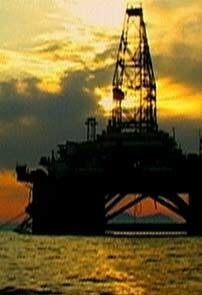 With consumption increasing every day and a finite global supply, oil's inevitable role in the future remains unclear. This oil platform is part of the vast complex of oil excavation near Baku, Azerbaijan. A second energy crisis occurs in 1979 after the Iranian Revolution transforms oil-rich Iran from an autocratic, pro-West monarchy under the Shah to an Islamic theocracy under the rule of Ayatollah Khomeini. Iran's oil supply is largely curtailed, prompting President Jimmy Carter to call the new energy crisis "the moral equivalent of war" in a nationally televised speech. The oil tanker Exxon Valdez is pierced when it hits a reef off Prince William Sound in southern Alaska. The supertanker dumps 39,000 tons of oil into the sound. Though not the largest oceanic spill in history, the incident is an ecological disaster for the coastal community. On August 2, Iraqi forces under Saddam Hussein invade Kuwait and seize control of the oil-rich emirate. Recognizing that they will likely soon be pushed out of Kuwait, Saddam Hussein's forces begin setting fire to Kuwaiti oil wells in January. Approximately 700 production wells are sabotaged, and the total spillage of crude oil is estimated to be anywhere between 46 and 138 million tons. Western forces launch Operation Desert Storm on January 17, and Kuwait is officially liberated by late February. The last Kuwaiti oil well is capped in November. The world oil price drops to $10 a barrel. 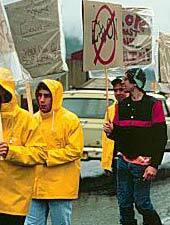 Valdez-based seafood processors picket Exxon's headquarters due to a shortage of work due to the Exxon Valdez oil spill. Photo courtesy of the Exxon Valdez Oil Spill Trustee Council. Ground is first broken for the construction of the monumental Baku-Tbilisi-Ceyhan (BTC) pipeline. In order to bring Caspian oil to thirsty world markets, a consortium of oil giants is formed in order to construct a pipeline that will traverse several problematic social, environmental, and geopolitical regions. Oil prices reach $49 per barrel in August, the highest price recorded since the New York Mercantile Exchange launched its oil futures market in 1983. The sudden rise in prices is spurred by news that Russia's biggest oil-exporting firm, Yukos, might be forced to halt its operations due to a multi-billion-dollar tax debt case. Yukos is responsible for supplying 1.7 million barrels of crude oil per day -- roughly two percent of the global supply.